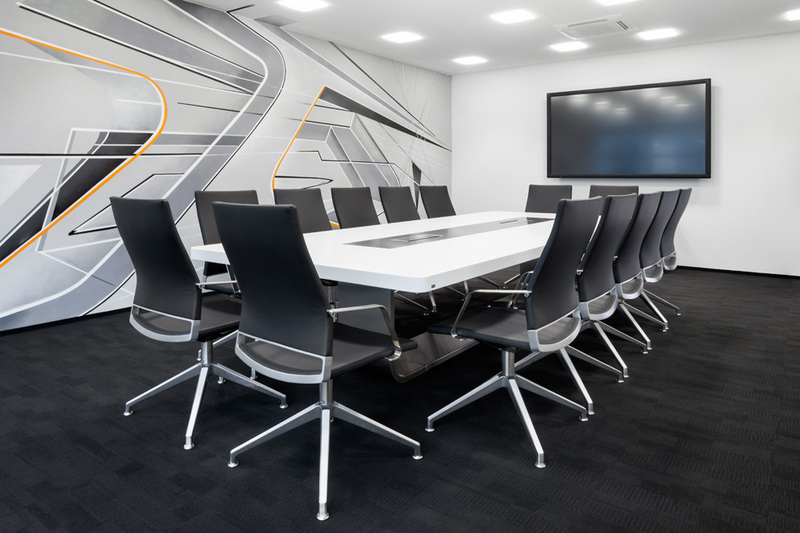 The new conference room at Düsseldorf property company “Codic” brings to mind rooms that feature in James Bond movies or in series like “Mad Men”, meeting rooms where crunch decisions get made. For this reason, the project developers at “Spectrum Management and Consulting” opted for an elegant, no-frills statement and consciously eschewed any zeitgeisty and colorful office environment. Any they hit the nail on the head with a purist choice of colors, with silver-grey, black and white surfaces that are likewise repeated in the headquarters’ offices and corridors. 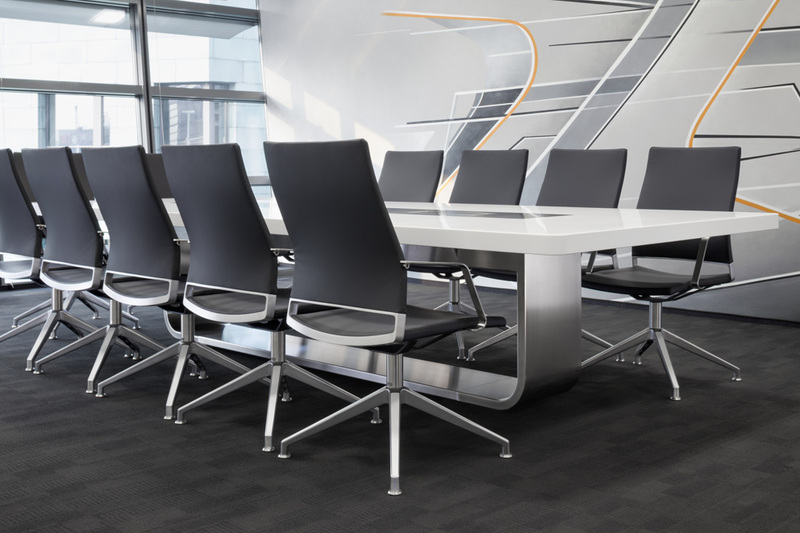 The Thonet office furniture forms the eye-catcher in the conference room – staff meet around a “S 8002” conference table designed by architect Hadi Teherani and take their places on comfortable swivel chairs from the “S 96” line – design courtesy of Randolf Schott. 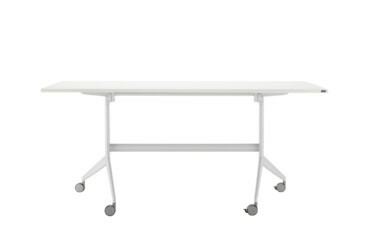 The elegant, white table top provides plenty of space for documents, laptops, tablet PCs, and a projector – and data and power connections are simple. 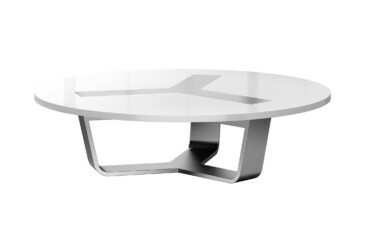 The middle of the table boasts a function section with integrated media-technology connections tucked away beneath an aluminum panel that closes flush with the top. Cables vanish from sight – quite literally into the base frame. 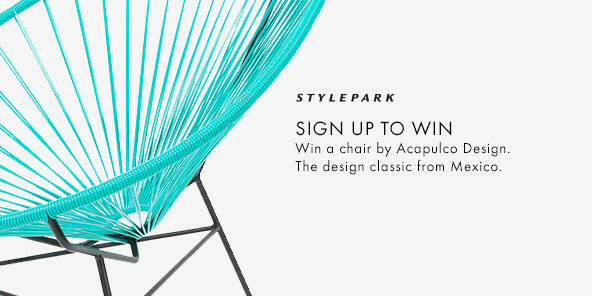 The frame itself is made of silver-shimmering aluminum – a broad, curved arc with rounded edges supports the top and bonds visually with the multimedia function section to form one closed band. “A fundamental design that focuses squarely on the function, the materials, the vectors, precision and above all ergonomics and people, whereby for all the formal appeal, tenaciously foregrounds the quality of usage,” is how Hadi Teherani explains the Thonet design philosophy, which is just as much evidenced by other items of Thonet office furniture. The swivel chairs, for example, also stand out for the coherent purist design of their black leather covers and a four-star aluminum base, destined to emphasize functionality. With its narrow armrests, a slight bend in the backrest, which boasts an opening toward the bottom, the chair looks refreshingly light and refined. Thanks to its ergonomic structure, staff members sit comfortably even through longer meetings – and their posture is likewise optimal. 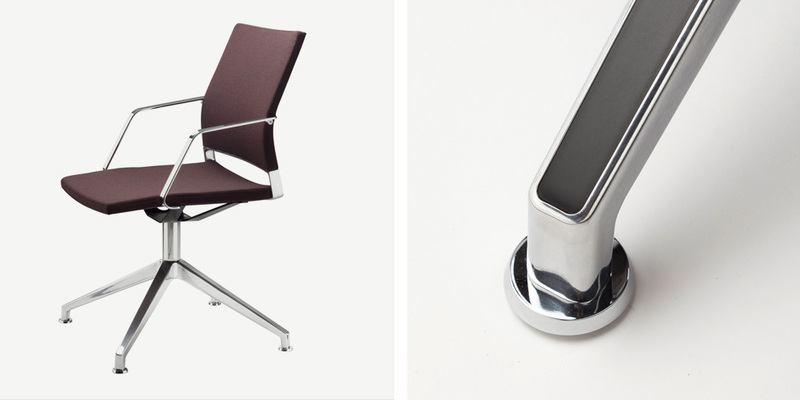 Moreover, the practical “re-set default” mechanism means the chair automatically returns to its original position – firmly in line with the Thonet motto that a chair is a chair is a stance.